EBM, Executive Business Machines is a market leader in outsourced IT services and has been supporting businesses in Connecticut, New York, and Massachusetts for 45 years. Established in 1972, EBM began as a typewriter and printer servicing business. Their approach is simple; Provide the best advice and innovative technology with exceptional customer service to grow your business and simplify IT. EBM provides managed services, project based professional services and hardware and software procurements. As part of their managed services program, EBM provides remote monitoring, management, help desk services, monthly or quarterly onsite reviews as well as an annual high-level review to help customers plan and budget appropriately for their IT needs. Project based professional services include assessments/upgrades, Cloud Implementations/Migrations, Network Vulnerability and Penetration Testing, Disaster Recovery/Business Continuity, Enterprise Networking and Storage and Hyperconverged Infrastructure. Hardware and software procurements are often expensive, so EBM's relationships with all the major vendors can save you money! Their main focus is to understand the client's business requirements and customize IT solutions utilizing industry standards and best practices. When asked why they joined the Greater Valley Chamber of Commerce and what they wanted to gain, EBM replied, "to develop new relationships, nurture existing relationships, networking opportunities and community involvement." We are excited to welcome EBM to our Chamber! When I was told that an inspirational speaker was coming today, I was expecting the normal “you can do it!” and “believe in yourself!” speech that we all know too well. Instead, I was presented with Victoria Arlen. The 22 year old model, athlete, actor, and motivational speaker told us about how she entered a state of vegetation at age 11 and defied her doctors’ diagnosis that she would not recover. Now, Victoria can speak, eat, move, and walk, despite her paralysis for 10 years. As a 17 year old, I can say that my attention span is very limited. However, she kept me and the women from the WIN group engaged the entire time she was speaking. At the end of her presentation, I told her that I, too, dream of working in the sports marketing and management industry and asked for her advice. She told me that working as a woman in sports is like being on an island by yourself and that I need to go after what I want. Hearing Victoria’s story and rise to success makes me excited for what my future holds. I hope one day I will be beside Victoria on ESPN talking about who we think will win the Super Bowl, or who the Jets will draft. Her courage, strength and attitude has helped me to realize that I can accomplish anything. ​So as we dig even further into getting to know our members beyond their businesses, we are finding they are authors, singers, band members, artists, readers, historians, gardiners, sailors, fishermen, and so much more! “I really enjoy the education that I get not only from the Connecticut Audubon Society and other members of Osprey Nation, but also from the regular people that happen to frequent the areas where the nests that I monitor are located, who have also been keeping an eye on my nests because they spend a lot of time walking the areas. They love to talk about everything that they witness and want to know more about if what they are seeing is normal behavior, what are their mating habits, where do they migrate, do they eat anything other than fish…. So it’s always an opportunity for me to capture info about what’s been going on since I’ve been there last and also help educate the rest of the community." - Click here for the full article with the Connecticut Audubon Society. As my summer here at the Greater Valley Chamber of Commerce comes to an end, I was asked to make a post about my time with the Chamber. When I first started, I was kind of new to the Valley. Growing up in Woodbridge, I would come to the Valley occasionally but didn't spend much time here. My first few days in the office were confusing, I never heard of the people or businesses that Nancie, Bill, Laura, and Al were mentioning. While I wouldn't say that I know the Valley like the back of my hand quite yet, I really did get to become familiar with this great place over the past few months. I met a lot of great people and checked out some pretty awesome places during my time here. Whether it was going to the Grand Opening at Stone's Throw on Housatonic River or touring the Legends of Fear Haunted Trail at Fairview Tree farm, every day was full of excitement. As I said before, I met a lot of great people during my time with the Chamber. I never knew who's hand I would shake that day and what new connections would be made. Whether it was a politician, bartender, small business owner, or a citizen, I had the pleasure of seeing what makes the Valley so special: the people. I would like to thank Nancie, Bill, Al, and Laura for taking me on as an Intern this summer. The experience was truly memorable. ​Finally, I would like to encourage everyone to check out the 6th Annual Greater Valley Restaurant Week taking place October 3rd-8th. Shantal and I worked hard to make this a great event for the community. Check out all the great spots the Valley has to offer. As we are always learning more about our members beyond their knowledge and expertise in their chosen fields, we have discovered that several of our Chamber members have published books! In celebration of their accomplishments, here is the first in a series highlighting those authors. Chamber member, Stephen Hodson, owner of Hodson Realty, Inc., has published an intimate piece on faith, life, and his own relationship with the Blessed Mother Mary. The book, That All May Know – Mary’s Guide to Holiness, follows Stephen’s ongoing relationship with the Blessed Mother and how such has helped to deepen his faith. Though focused on Mary, he leads his audience in a simplistic discussion of several Catholic traditions, allowing even those who do not follow the faith to follow along and understand. While easily understood, Stephen suggests his readers experience his story in a quiet place where its messages can be internalized; “It takes a while to develop and much of the valuable insights are revealed as the book progresses.” Such insights include better understanding of Mary's guidance and love for all of her children as well as how Stephen has used music to relate to faith. For Stephen, music is a vehicle in which he expresses his devotion. He sees his creativity as a gift which not only allows him to better appreciate faith, but to participate in the creation of new works which may be used for further devotion and inspiration. While passionate about his music, he remains humble in explaining that all have been given gifts such as "the ability to give and receive love, the blessings of intimacy, and the extraordinary gift of participation in the creation of life." These talents bestowed upon us are seen as treasures "that each of us possess in unique ways." While he places emphasis on everyone being blessed, he also makes sure to allow room for uniqueness. “No one else is called to do exactly what God has created you to do…” It's through his explanation that readers are able to feel a sense of community while also feeling pride in knowing their own worth is unique and unmatched. When asked about his inspiration behind his published work, Stephen replied, “I have had some wonderful experiences based on my devotion to the Blessed Mother that I would describe as miraculous.” He explained that, “The many connections that God provided me has led to this book that I felt should be shared with others.” It’s the act of experiencing that has compelled him to not only write down his own thoughts, poems, and prayers, but to share them in hope that they may help bolster others’ faith as they have done for him. Steve’s book is available on Amazon.com or BarnesandNoble.com. Spotlight on Laura Gorman of GVCC! ​Laura Gorman, Director of Membership and Services at the Greater Valley Chamber of Commerce oversees the management and oversight of membership, recruitment, development and retention of members. In layman's terms, she helps our Valley grow by encouraging businesses to join the Chamber. In addition to membership, Laura coordinates ribbon cuttings and other events such as the Chamber’s Annual Business Expo . Laura is staff liaison to the Ambassador Committee, Seeds to Leads Networking Group, Valley Business Network and Healthcare Council. Laura finds pride in her work for through the Chamber she is able to both help people professionally and personally. Because of her passion for helping others, she explains that if she didn't have this job, she could see herself as an event planner- preferably by a resort somewhere warm and sunny, all year round. Laura excels at her position in the Chamber because she is a great multitasker, very organized, and pays great attention to details. In the Chamber, you're always meeting someone new, and Laura's outgoing and friendly aura allows for a welcoming environment everywhere from simple meetings in the office to big offsite events. It's no wonder she favors a color connected with confidence, energy and determination; red! Keep up the great work at Chamber Laura, we're thrilled to have you as part of the team! Spotlight on Chamber Member Speake Software! 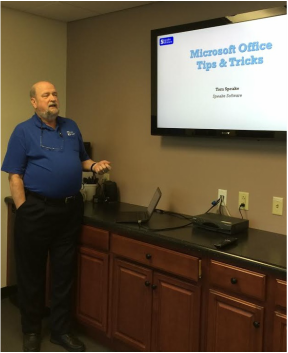 Tom Speake of Speake Software came to the Greater Valley Chamber of Commerce to talk about his area of expertise; Microsoft Office. "A lot of people say they know Microsoft Office" Tom stated noting that in reality it isn't always the truth. "As soon as people can get their jobs done, maybe not done the best, but done, they think they know Microsoft Office." What we don't realize is that there are easier and better ways to get what we need to get accomplished done. Until we know these better, more efficient ways, can we honestly say we really know Microsoft Office? While Tom Speake notes that he is Microsoft Office Certified, he explains that there's always more to learn; "every time I teach I learn something new." Perhaps this is why Speake enjoys leading courses and giving private consultations on Microsoft products. "I like giving out scavenger hunts" Speake explains stating that he gives his students lists of things to find in the Microsoft menus in order to encourage exploration. Other tips to keep in mind include being logical about where you go to look. If you're looking to find the spelling "ABC" check button, it's more likely to be in the tab labeled "review" then the tab labeled "insert". The terminology matters! If that doesn't work don't forget to check the drop down menus. More options are usually available if you can find the little downward arrows to click on. Of course as Tom says, "Practice makes perfect." Exploring Microsoft Office, taking a course, sitting in on a lecture, or even asking for a private consultation can be critical in improving your ability to get the most out of your Microsoft products. From the short session this morning alone, the room roared with similar reactions of: "Ohhh…" and "So that's how you do it!" Some of the more clever and helpful tips were followed by rounds of applause. And while it pains me to admit it, (because as a millennial I'd like to think I know everything about electronics) I learned a few new things myself as well. A lot can change in a 100 years. For example, in the past century, production across the nation's farmlands has been in decline. Fortunately this is not the case for the Massaro Community Farm, celebrating its 100th year in business. Originally just over 100 acres, the current Massaro Community Farm remains at a modest 57 acres of land which they have constantly had to fight for. After the death of the last Massaro son in 2008, the property was deeded to the Town of Woodbridge, which considered multiple proposals, including turning the land into more athletic fields. But the push to convert the property into an organic vegetable farm and community space prevailed. Thanks to the timing of the growing locavore movement, Massaro found widespread support to renovate the farm, in spite of a national recession. Hundreds of volunteer hours and USDA grant funds went into building renovations, deer fencing, equipment, a greenhouse and more. Farm-based education became a reality as workshops began, allowing people to connect to better understand the local food movement, health, and wellness. While it’s clear that farm-based education was a huge part of why Massaro Farm bonded so closely with its community, their contributions didn’t stop there. The farm commits 10% of weekly harvests go to local hunger relief agencies. In fact, Massaro farms has donated over 33,000 pounds of food since 2010! Massaro Community Farm is proof that small farms can be successful. Executive Director, Caty Poole, says there are three key pillars to survival. "First, stick to your core purpose and do it well; at Massaro, farming sustainably takes the highest priority. Second, core community partnerships are priceless (like AmeriCorps, hunger relief agencies, and the Valley Chamber). Lastly, diversify your revenue stream. The farm sells produce, holds fundraising events, offers farm-based education and rents the farm for special events. These aspects will ensure that Massaro Community Farm will thrive over the next 100 years. Meg Johnson, Connecticut’s first Certified Balloon Artist, who helped create one of the world's largest balloon sculptures (which can be seen in the Guinness Book of World Records) has just accomplished yet another fantastic achievement. Her company, Great Event Decorations, which she runs with the help of her husband, Eric, is celebrating its thirty years of business! Through the years, Great Event Decorations has grown from a small balloon focused operation to a much larger event décor company. It's been identified by the Women's Business Enterprise National Council as a certified Women Owned Business and has even been featured in the Connecticut Post's WomenWise section as well as the Bridgeport News, Fairfield Citizen, Fairfield County, Business Journal, the Stamford Advocate, the Trumbull Times, and the Valley Republican-American. Eric Johnson, who has been crucial in expanding Great Event Decorations beyond balloons is known for his creations such as his numerous parade floats and sculptures. As creative director he’s often said "Do you know what you could do with that?" offering not only creative solutions, but innovative possibilities when it comes to design and fabrication. "At Great Event Decorations we produce welcoming and visually exciting decorations to create memorable event experiences." says Meg Johnson but even more important is this company's dedication to customers. Decorations are always tuned to the customer's demands. "We have a conversation and try to understand your decorative goals." Such conversations allow not only for open communication but help the team include more personal details and customization. It's because of these personal interactions that Great Event Decorations is praised for its ability to listen carefully to the needs and desires of customers as well as being able to work within their budgets. Another common praise given (besides customer service) is on the mood provided by both Meg and Eric. Meg and Eric are described as energetic, passionate, hardworking and creative individuals- but there's one other word that keeps popping up in other's descriptions of them: "fun!" Perhaps that’s one of the keys to running a successful event decoration business; you need more than just the passion and skill- for Great Event Decorations you can’t forget the fun! 40 Facts On Our 40 Under 40 Featured Members! In honor of chamber members Kayleigh Apicerno and Michael Sciamanna being featured in Fairfield County Business Journal's 40 leading professionals under the age of 40, we've decided to make a list of 40 fun facts about said featured members! 18. In March of 2015 she visited St. Lucia (which was her first time out of the country besides a brief visit to Canada as a child). During this visit she challenged herself by limiting her technology use which allowed for a better enjoyment of the beautiful island: "It was a gorgeous island. I did not use my phone or any technology the whole time I was away (besides taking photos)! 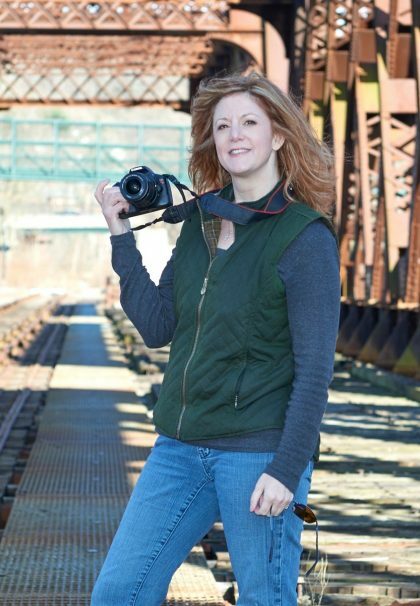 It was tough, especially since my business is social media, but somehow I made it through!" Bonus: She has participated in NaPoWriMo for several years. 24. In 2014 he argued on behalf of his son for full day kindergarten in Shelton. His first grade son explained; "I think some kids in our class really could have been helped and we wouldn’t have to spend so much time reviewing things that we know already." 40. Was part of the record breaking 1.33 million dollar 2013 Webster United Way Campaign which allowed for bankers to come together, be the change, and show what it means to "Live United."